On Wednesday morning, November 9, 1994, Governor Pete Wilson stood before a jostling crowd of TV cameras in a downtown Los Angeles hotel. Smiling and buoyant after his surprisingly large re-election victory the night before, he held up an executive order he had just signed. The directive implemented the first stages of newly passed Proposition 187: it cut off prenatal care and nursing home services to undocumented immigrants. Wilson’s campaign had made the punitive ballot measure with its race-baiting message a core element of his campaign. Called the “Save Our State” initiative, it prohibited undocumented immigrants (often referred to as “illegal aliens” by advocates) from a range of social services including health care and public education. Proposition 187 had won in a landslide; its angry, anti-immigrant message resonated with a predominately white electorate. The measure’s popularity propelled Republicans into four out of five statewide offices. Wilson beat Democrat Kathleen Brown by 15 percentage points. The Republicans also gained a 50-50 split in the state assembly and won half of the state’s Congressional seats (contributing to the new majority that elected Newt Gingrich speaker). Conservatives in other states quickly took note. Within a decade, half-a-dozen other states had passed anti-immigrant laws. California, which had given the nation surfing, the free-speech movement, and psychedelic rock, had launched yet another trend. The passage of Proposition 187 in 1994 was the result of a two-decade surge in immigration to California. Between 1970 and 1990, the share of the foreign born in California jumped from just nine percent to nearly 22 percent. As Pastor notes, “In essence, the rest of the country was shielded from the demographic wave as California absorbed the bulk of the flows” of new immigrants from Latin America. Contributing to the anti-immigrant attitude was the continuing stagnation of the state’s economy, leading to charges (basically false) that immigrants were coming to take advantage of the state’s relatively generous welfare benefits. The final “shock” to white voters came with the massive riots and looting in parts of Los Angeles in 1992, following the acquittal of four police officers in the beating of black motorist Rodney king. Many older white TV viewers cringed at the images of blacks and Latinos running out of discount stores with televisions and cameras in their hands while police were nowhere to be seen. The November 1994 victory for Wilson and Proposition 187 proved to be a highwater mark for Republicans in the state. In 1998, federal courts declared Proposition 187 unconstitutional. In the backlash to the measure, Latino activists staged massive rallies around the state and launched voter education drives. Between 1992 and 2000, more than one million Latinos registered to vote. By 2000, California became the first mainland U.S. state to have a non-white majority. The 2010 census recorded the state’s population as 38 percent Hispanic, 40 percent white, non-Hispanic, 13 percent Asian and 6.2 percent black. Politically, California was now a solidly “blue” state by 2016, with Democrats holding all statewide offices, a commanding majority in the legislature and 39 of the state’s 53 congressional seats. Pastor, a professor of sociology at the University of Southern California, also serves as the co-director of the school’s Center for the Study of Immigrant Integration. He has co-authored several previous books includingEquity, Growth and Community: What the Nation Can Learn from America’s Metro Areas. While he cites an impressive number of California election returns, unemployment statistics and demographic shifts to make his case, Pastor stumbles when it comes to offering specific solutions. Like many university professors, he is skilled at researching and analyzing trends, but less able to formulate practical solutions that are easily understood by the general population and adoptable outside the hothouse environment of university campuses. For example, Pastor advises progressives that they must “untangle the rules that bind” and build “intersectional movements that are less susceptible to infighting.” Exactly how these obscure objectives are to be carried out is never clearly defined. Nevertheless, Pastor’s book is insightful and a valuable contribution to Democrats and progressives who are struggling to come to terms with the election of Donald Trump. 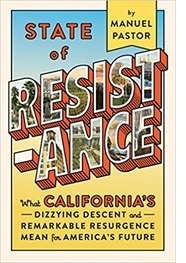 By focusing on how progressives lost power, then regained it in California, he offers a positive object lesson. While other recent books on the Trump phenomenon have indulged in handwringing about the flaws of the Clinton campaign and the “loss” of the Midwest, Pastor presents a more optimistic tale and offers paths to move forward.